'Twas the night of the zombie pirate MC. 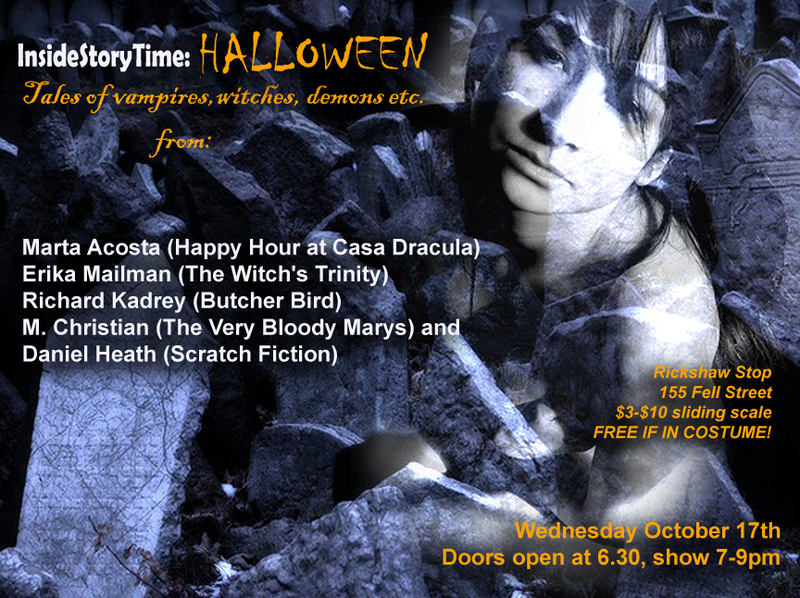 Marta Acosta did be explaining why women prefer vampires, and did also relate some notorious goings on at Casa Dracula. Erika Mailman did be reading from The Witch's Trinity, the history of a woman accused of witchcraft. M. Christian did give us a scene with a vampire cop visiting a San Francisco blood bar. Jen Burke Anderson told a horror story about San Francisco public transport – she did be standing in at the last moment for Richard Kadrey, who was sick and did not be showing up. Daniel Heath did relate manifold stories about such matters as an undead easter bunny, and did win a bottle of Richard Kadrey's blood for his performance at charades.